Ed Kidera has made over 6450 signed pieces over the last twenty years. They include andirons, bowls, bells, bird baths, bird feeders, boxes, candle holders, creatures, easels, outdoor fireplaces, fountains, frames, furniture, gates, gongs, hose reels, key racks, lamps, lanterns, mailboxes, masks, mugs, racks, rain dancers, sculpture, signs, stands, steampunk, sundials, switch plates, tea sets, trellises, umbrella stands, vases, wall hangings, weathervanes, wind dancers, wine racks, and more. The vast majority of the materials used in Ed Kidera’s work had a past life. The primary recycled material comes from compressed gas cylinders, such as oxygen tanks and fire extinguishers. Ed also uses parts from farm implements, trucks, cars, industry and weld shops. New in 2010 is a line of Steampunk weapons, canes and even time machines. Each piece is made almost entirely from recycled materials and is one-of-a-kind. To add to the fantasy that is Steampunk, the pieces come with stories about a fictitious inventor, fantastic claims, and exotic histories. The bookends and the canes are functional; everything else is fantasy art. Check out the Maets Foundation. 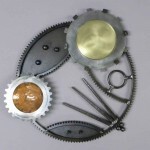 For over twenty years Ed has been sculpting bells and other sculpture from recycled materials. For over eighteen years he has been a full time artist doing art and craft shows across the United States. Currently, over sixty galleries carry his work, from Alaska to Maine and from Michigan to Florida. Ed’s background was not in art, but in the equally creative vocation of engineering. He has a BS in Applied Science and Technology and an MS in Ocean Engineering. He began in the late seventies inventing and designing equipment for use on and in the ocean. His systems are still in use today. After a short stint as an Associate Professor at the US Navel Academy he turned to computer software in the eighties. A love of the outdoors and landscape gardening prompted Ed to make his first two bells in 1991, and the rest as they say, is history.